In The Maze , a man’s near-death experience throws him into a psychological-spiritual-symbolic labyrinth that calls into question everything he’s been and whether it’s worth it to him to be something different. Jamie Burroughs is a man whose moral needle points to the yellow, “pretty good” region of the dial. He’s never killed anyone, he would argue, or robbed a bank, and the things he’s done wrong don’t hurt anybody. Until a beautiful former girlfriend shows up, presenting a new vision for how his life could be, and puts his marriage and his son’s future in jeopardy. 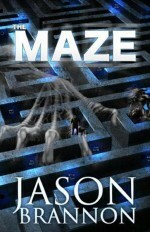 The Maze is a sort of 21st-century The Pilgrim’s Progress , and the labyrinth where James wanders is a vision of Hell-as-therapy, a place where the distractions are stripped away and the choices Jamie — and we — make are terrifyingly real. This story has elements of horror, but it has hope in abundance — hope that is hard-won, painful, and searing, just like in real life. As in Pilgrim’s Progress, the hope is explicitly Christian in its source. But as someone who gave up on “Christian” fiction a couple of decades ago when I found it poorly written and overly “magical,” I was pleased to find this book both supernatural and grittily realistic. My only criticism is that the “good” guys weren’t drawn with the same larger-than-life clarity as the bad guys. That’s part of the point, I suppose — that good people seem boring — but in the short but crucial roles they play in the story, they seem to fade against the strong and and colorful evil characters. Still, by the time that became apparent, I was already hooked in the story, and it was more a passing “hmm” than a real deterrent from finishing the book. If you like your fiction happy-clappy with rainbows and butterflies, this book isn’t for you. If you like a thoughtful exploration of how our decisions tattoo our souls — and what it might take to get those tattoos removed — then you’ll find James’ trip through the labyrinth compelling and thought-provoking.